​ ​ On 4 March 1868 in the village of Cann near Shaftesbury in the Blackmore Vale of North Dorset, Sarah Ann Bridle, unmarried, living on her own and a month shy of her twentieth birthday, gave birth to a boy, registered as Augustus John Bridewell. It is unclear why Augustus' birth record lists his surname as “Bridewell” – was this Sarah Ann's attempt to conceal her family name from the registrar, or just a loose use of phonetic spelling by the registrar? Other bearers of the Bridle surname were occasionally recorded as “Brydle”, “Bridell” or “Bridewell” in less official documents, so correct spelling of surnames may not have been a priority for everyone who was involved in record keeping at the time. We do not know who else was present at Augustus Bridle's birth but there is much documentation of who was at his funeral service at 3 pm in Toronto on 23 December 1952. The honorary pallbearers included the renowned composer, conductor and educator Sir Ernest MacMillan; the painter, sculptor and businessman Ivor Rhys Lewis; the painters Fred H. Brigden and Fred S. Haines; G. D. Atkinson, music director and piano and organ teacher at the Ontario Ladies' College in Whitby, Ontario; the cellist Boris Hambourg; the muralist Fred S. Challener; and the journalist/author William R. Plewman. The brief, simple service featured the playing of the slow movement of a violin sonata composed by Dr Healey Willan, performed by Elie Spivak, a former concert master of the Toronto Symphony, with Willan at the piano. The attendance was emblematic of the broad reach of “Gus” Bridle's life in Canada, as was the place where the service was held: the Great Hall of the Arts and Letters Club of Toronto, which he had helped to found and to energize. It was a long and improbable path from Cann to Toronto, from the infant “Augustus Bridewell” to Augustus Bridle, arts and drama critic for the Toronto Daily Star, organizer of choirs and concerts, “Fellow Member Number One” and the “Father of the Arts and Letters Club”. The identity of Augustus's father remains a mystery, but we know a little about his mother. Sarah Ann Bridle was born on 4 April 1848 in East Orchard, Dorset. Her father Charles was a blacksmith, one of thirteen children of another blacksmith, George, who raised his large family in nearby East Stour. The “Bridle” name, unusual outside the western counties of England, is not unusual at all in Dorset (and George Bridle the blacksmith clearly did his part to make it even less unusual within the Blackmore Vale). Like many English surnames, it derives from a trade: “bridelsmyths” were workers in leather and metal who made bridles for horses. Augustus's name was spelt correctly on the record of his baptism on 26 April 1868. This second record of Augustus' presence on Earth lists Sarah Ann as a “single woman” and shows that he was baptized in Compton Abbas, a village about 3 miles south of Cann. Augustus would soon be an orphan. His grandfather Charles Bridle died in December 1869 at age 46. On 6 October 1870 his mother Sarah Ann died of consumption at age 22. Just two and a half years into his life Augustus' closest Bridle ancestor was his then-78-year-old great grandfather George Bridle. The “Dr S.'s House” who accepted Augustus, was the London orphanage founded by Methodist minister Thomas Bowman Stephenson in 1869. Originally known as “The Children's Home”, it later became the “National Children's Home” (and since September 2008 has been called “Action for Children”). Augustus Bridle's placement appears to have occurred in April 1872, about the time when Stephenson's began to house 24 boys and 4 girls at the Wheatsheaf Inn in rural Edgeworth, Lancashire. Before that, the Stephenson's children lived in a former factory of the Victoria Stone Company in Bonner Road, Bethnal Green, London. George the blacksmith died at age 84 in 1876, four years after Augustus went to the orphanage. The Bridle family in Canada has an unfinished three-page memoir by Augustus describing his early life. In it he states that “I went to school in England for about six years until I was ten. They shoved you through there, about ten hours a day. I lived at the school.” Those six years would have been from 1872 to 1878. After that, Augustus's life changed dramatically. 10-year-old Augustus left England on 13 July 1878 to cross the Atlantic to Quebec in a group of thirty-six children in steerage class aboard the Dominion Line's Borussia . They arrived in Quebec on 25 July 1878. Augustus took with him to Canada a small metal-clad cedar trunk that is now in the care of his grandchildren at a cottage on Whitefish Lake, near Rosseau, Ontario. 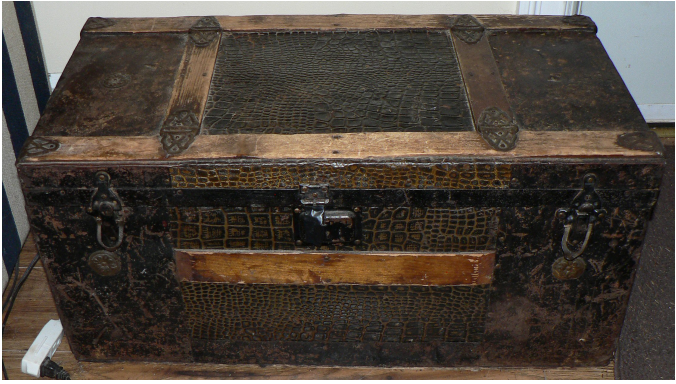 Inside the lid of that trunk is a painting of hunting dogs in a brook running through a pasture. As Dorset's Blackmore Vale had been the backdrop for an almost-Dickensian start to Augustus's life, one wonders what memories the trunk-lid painting conjured up for him later in life. It may, however, have been a portent of sorts, as he would ultimately help to found a place where some of the most innovative and best-known painters of Canadian landscapes, the Group of Seven, would meet. The river expedition described by Mr Stokes may have had a journalistic purpose. The George Gwynne Mann Family Fonds at the Saskatchewan Archives Board contains two parts of a series of articles about Augustus Bridle's experiences in Cree country 150 miles east of Edmonton while boating down the North Saskatchewan River with at least one other journalist. Augustus returned to Stratford, Ontario in 1901 (the Edmonton Bulletin noted that he received a “lucrative offer”) and began to write for the Stratford Herald and later the Toronto News. From 1908 to 1916 he was associate editor of the weekly Canadian Courier, then from 1916 to 1920 he was its editor. In 1910 he published his first book, “A Backwoods Christmas”, a homely sketch of how Christmas was observed in Ontario in earlier times. In 1919 he was briefly the editor of Musical Canada, which published from 1907 to 1933. Writing was his source of income throughout his life, but his greatest passion was for music and the arts. He sang for several years in the bass section of the 200-voice Toronto Mendelssohn Choir, founded in 1894 by A.S.Vogt. In his 1963 memoir “What's Past is Prologue”, Vincent Massey, the lawyer, diplomat and patron of the arts who became Canada's eighteenth (and first native born) Governor General in 1952, wrote of Augustus' role in the Arts and Letters Club of which he held the position of Chairman: "I spent many happy and refreshing hours at the Arts & Letters Club in Toronto. It had, and still has vitality and personality ... The presiding genius of the Club for many years was Augustus Bridle, who fully embodied its spirit. One of his greatest contributions was to lose its constitution so that we were not duly concerned with machinery. The constitution did survive in musical form, having been set to plainsong by Healey Willan." After the First World War the Arts and Letters Club became a regular gathering place for members interested in literature, architecture, music, painting, sculpture, photography and the stage. Among those who met there regularly were a group of eight landscape artists seeking a new direction for Canadian art – Tom Thomson, J.E.H. MacDonald, Arthur Lismer, Frederick Varley, Frank Johnston, A.Y.Jackson, Lawren Harris and Franklin Carmichael. Thomson drowned under mysterious circumstances in Algonquin Park in 1917 but the others, known as the “Group of Seven”, became the most important Canadian artists of the first decades of the twentieth century. In September 1910, Augustus made his second voyage across the ocean to England. This time he travelled first class; the exact nature of his trip is unknown. Was this brief return to England a way to over-write memories of crossing on the tiny Borussia with a more pleasing experience? Was it motivated by a wish to see his country of origin, however briefly; or to learn more about his patrons at the orphanage? Or did he simply take in the English arts scene while enjoying a first-class two-week holiday there and back? Ironically, in 1911 cousins of his emigrated to Canada and settled in Hamilton! It is unlikely the relatives knew of each other’s locations, it is left to speculation if the family in Hamilton wondered about their possible connection to the the increasingly well-known Augustus Bridle in Toronto. On 8 November 1913, aged 45, Augustus married 27-year-old Martha Emily Scroggie, daughter of George Edward Scroggie and Margaret Thompson, in Toronto. Their first son Paul Augustus Bridle was born on 15 October 1914, their second son George Emerson Bridle was born in 1917, and their daughter Margaret Florence Bridle was born on 4 May 1921. In 1916 Augustus published a book “Sons of Canada”, thirty-four biographical sketches of prominent men in Canada; including accounts of Prime Ministers Robert Borden and Wilfrid Laurier, of mounted policeman and soldier Sam Steele and of portrait artist Edmund Wyly Grier (whose own drawing of Augustus Bridle c.1910 is shown in this article) In 1921, Augustus followed “Sons of Canada” with “The Masques of Ottawa”, written under the pseudonym “Domino”. In 1922 Augustus Bridle began a 30-year association with the Toronto Daily Star as an arts, music, drama and film critic, and book reviewer. He also became an active supporter and promoter of the arts in and around Toronto. Under the auspices of the Star, he organized over a hundred free 'Good Music' concerts (later known as the 'Star Fresh Air Fund' concerts) and several free ' famous music' and carol concerts. He participated in the creation of the Canadian National Exhibition Chorus, a mixed choir of about 2000 members which may have been the largest choir in North America at the time. He may also have been Canada's first radio talk show host. According to John B.Withrow writing in the March/April 1993 edition of the periodical Bravo, the Star opened it’s first radio station in 1922 at the Canadian National Exhibition. Augustus interviewed important visitors to Toronto in this early, if not the first, radio talk show. “Having had experience with a Grand Trunk conductor telling him he was on the wrong train, he was much impressed to find the Bursar a rajah of still greater official solemnity. With the meticulous brevity of a timetable he was informed that his First Class 'C' certificate was invalid for matriculant registration. The Bursar seemed to feel that the said certificate with its red seal of the Department of Education, was a very amateur, if not offensive, document. The Bursar gave him a sub-arctic look. The Bursar rose like the little cloud that Elijah saw before a big rain. Could this tell the story of Augustus's own admission to the University of Toronto, given the reference to that institution in his 1922 “Who's Who” biography? In 1927 Augustus staged a symbolic pageant "Heart of The World" at the Canadian National Exhibition in Toronto for an international meeting of the World Federation of Teachers. His article “Who Writes Our Music?” in the 15 December 1929 issue of Maclean's magazine was the first comprehensive survey of contemporary Canadian musical composition. In 1940 Augustus formed the Coliseum Chorus, again with the backing of the Star. The chorus gave its first concert on 29 Aug 1940 at the CNE accompanied by the (Edward Franko) Goldman Band of New York. Later that year the chorus sang at Maple Leaf Gardens with the Toronto Symphony Orchestra under Sir Ernest MacMillan. It gave six concerts to raise money for war charities before it disbanded in 1942, due to increasing involvement of Canada in war work. Augustus left a lasting legacy through the Arts and Letters Club which continues to this day as an important gathering place for arts professionals and arts lovers in Toronto. Another part of his legacy is his family. Paul Augustus Bridle, Augustus’s first son, was educated at the University of Toronto, receiving his BA in 1937. He then taught briefly at Upper Canada College before joining the Canadian Navy in World War II. Paul Augustus Bridle joined the Canadian diplomatic service and served in several senior capacities in the Canadian High Commission to Newfoundland at the time when Newfoundland became part of Canada. In that role he played a significant part in the negotiations with Joey Smallwood over the detailed terms of Newfoundland's entry into Confederation. Augustus' first sight of land in North America as a 10-year-old aboard the 'Borussia' was probably the coast of Newfoundland (if the children were able to look out at all on those voyages). It adds to the pathos of his tale that if that 10-year old with the little trunk did glimpse the Newfoundland coast on that voyage, how inexplicable it would have seemed to him that his own son might grow up to play an important role in making that very coastline one day part of Canada. That 10-year-old boy was destined to be, in a sense, a latter-day Grandfather of Confederation! "Hansen" is really a story about realizing Canadian aspirations both personally and for a young country. In the transition from Augustus' humble birth to Paul's diplomacy, real life even exceeded the fictional story. From BHCARA: Of the hundreds of British Home Children stories the BHCARA has researched, written about, reviewed or heard of, Augustus was certainly one of the most, if not the most, accomplished and influential BHC to Canadian history. It is our honour to have been chosen to share his incredible story.